The linchpin of the Northern Powerhouse is surprisingly weak on budget digs, which makes the arrival of this personality-packed converted Victorian warehouse particularly welcome. Its 16 rooms offer great value, with battered brick walls and railway sleepers upcycled as bed frames, topped with Hypnos mattresses. The marble shower rooms are teeny, but have full-size REN toiletries, and there are tongs and straighteners as well as hairdryers. 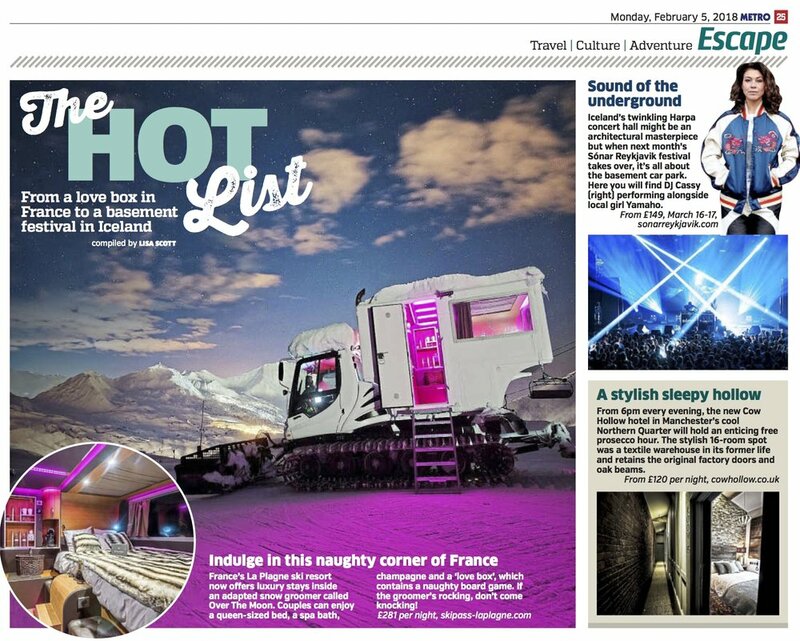 There’s even a free glass of prosecco to set you up for the Northern Quarter’s full-on nightlife. This 16-bed conversion of a Northern Qurter textile warehouse makes good use of the building’s industrial heritage. Exposed brick ad metal staircases are softened with artworks, neo-Moorish tiling and interesting decorative objects. Bedrooms come with REN toiletries, high-quality Bluetooth speakers and free Netflix. Guests are served complimentary prosecco and nibbles each evening, and milk and cookies before bed. Cow Hollow does not have a restaurant, but there are cocktails and decent glasses of wine in its tiny, glamorous bar. With its thriving indie boutiques, bars and galleries, the Northern Quarter is Manchester’s most exciting neighbourhood. And the newest addition to the city’s hotel scene, The Cow Hollow Hotel is in one of its handsomely restored red-brick warehouses. The bedrooms nod to the building’s Victorian heritage (oak beams, marble fireplaces and original textile factory doors), while showcasing work by Mancunian artists. Netflix access in bedrooms, Ren toiletries, and a complimentary prosecco hour each evening provide the finishing touches. Feel free to follow our Spotify music playlist below. We cant promise it wont go from Ethiopian Jazz to Honky Tonk Americana, horrendously quickly though. 57 Newton St, Nothern Quarter, Manchester, M1 1ET. 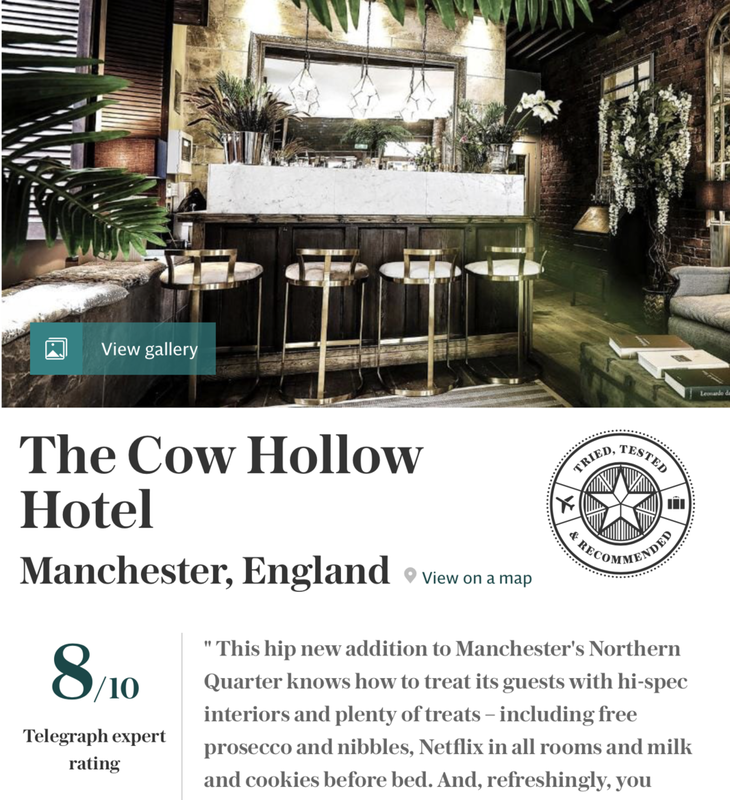 info@cowhollow.co.uk © 2015 Hotels Manchester Ltd, 'The Cow Hollow Hotel' and 'Cow Hollow Manchester'. All rights reserved. Manchester Boutique Hotels, Apartments & Hip Hotels.